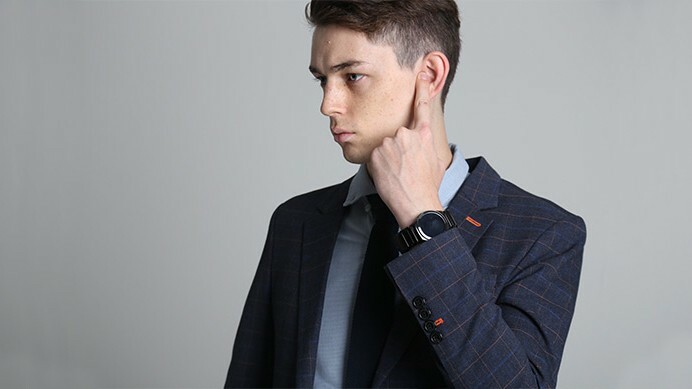 TipTalk is a watch strap from Innomdle Lab, a startup spun off from Samsung's secretive C-Lab, that makes regular watches smart and smartwatches smarter. It vibrates when you get an alert, tracks activity (steps, distance, workouts) calories burned and has a better-than-most battery life of seven days. The big draw here, though, is listening to calls and voice messages on your smartphone or smartwatch discreetly. This is the genius bit. TipTalk lets you do this by generating vibrations on the strap itself, these are then passed through the wrist and hands until they reach your fingertips. The wearer simply presses their fingertip (of the same hand) to their ear to hear the sound. Eavesdroppers, then, can't hear that side of the conversation. I tried TipTalk out very briefly at CES 2016 and I can confirm the vibrations work as promised after an initial delay in the demo. I could feel, and hear, the strap vibrating on my wrist but when I took my finger away from my ear - I was probably pressing harder than I needed to - I couldn't hear the voice anymore. I had to concentrate more than normal on listening to the voice message but considering I was in the middle of a busy trade show floor, I could still make out the words. Privacy ensured it would save the hassle of pulling out your phone to listen to a quick voicemail, WhatsApp voice memo or Vine audio, say. Plus TipTalk gets bonus points for making me feel like an actual spy and not just a nerd bringing my watch up to my ear. The black, link bracelet strap is fairly bulky and shiny right now so hopefully the tech is slimmed down a little and polished up to match stylish wristwatches. The module itself is tiny enough to be easily hidden. Plus, in terms of compatibility, the team wants to make sure TipTalk can be used with any existing watch body not just, say a Samsung Gear S2. TipTalk will work with both iPhone and Android phones. I didn't get to try out any of TipTalk's other more me-too features in my CES hands on but that's a job for a full review. Hyunchul Choi, CEO of Innomdle Lab and inventor of TipTalk, told us that the strap "will go on sale later in 2016 for a price under $100" to keep it competitive, possibly with an initial launch on Indiegogo. For something which essentially turns your regular watch into a smartwatch, we reckon that's a very good price. The Chronos smart disc, which we also saw at CES, performs a similar function and is selling for $99 at pre-order with a slightly higher $129 retail price. Innomdle Lab is one of nine startups which started life inside Samsung's HQ in Korea. At CES, we also tried out the rink controllers for Gear VR, another new wearable tech concept which may be developed in house or via a new startup. Plus Samsung's The Humanfit platform is creating smart suits, golf shirts and solar powered bags. If you thought the Gear S2 was it for Samsung, you're wrong - it's all happening.